Whats in a name? What’s in a room? What’s in a face? What’s in an oil? Margaret Hema. The name is one which many know. Her oils became famous when Lord of the Rings actress Liv Tyler told the world that her skin was being looked after in New Zealand by a relatively unknown Wellington facialist and producer of oil for the skin. The fashion world went mad for Margaret’s oils, now written about in Harpers Bazaar, Elle, Mindfood, British and Australian Vogue, and voraciously consumed by the Primrose Hill set in London. She has massaged the faces of Sadie Frost, Elijah Wood, Sean Bean and Cate Blanchett. As she has cared for some of the worlds most famous faces, Margaret Hema has almost all her life remained in her Wellington. For the first twenty four years or so her modest studio was hidden away in the Harbour City building near Lambton Quay. Now she is at 49 Courtenay Place. It is un-signposted. But it doesn’t need it to be. The world comes to Margaret Hema. People will go to great lengths to seek her out. "I had read about Margaret as a fourteen year old girl, wolfing down fashion magazines with abandon"
I had read about Margaret as a fourteen year old girl, wolfing down fashion magazines with abandon. I saw her glass bottles filled with oil when I visited a well known New Zealand Designer shop (Zambesi) I certainly couldn't afford to browse as a teenager. 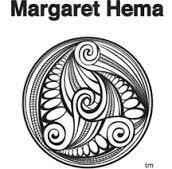 Hema was a name that I recognised and knew as the peak of quality and beauty in New Zealand. Once, I remember on a long trip as a teenager with my family, I chose a bottle of Hema water to drink and felt very sophisticated for it. My admiration was from afar of someone bold enough and good enough to gain the attention of the rest of the world. Flash forward 13 years, on the suggestion of a supporter of the Residents, I send Margaret an email to explain The Residents project, never expecting anything back. I was astounded when she not only agrees to an interview but offered to give one of her facials (Margaret is notoriously reluctant to be interviewed, let alone photographed). Her one condition was that it is not recorded in my usual manner (“I never give recorded interviews”). I could hardly believe it. However, there I was, looking on Google Maps for where 49 Courtenay Place is, on one of the hottest Saturdays of the year in Wellington, unsure of what to expect, but understanding thoroughly that somehow I had gotten myself in a very privileged position. My timing is almost sabotaged by Matt, my boyfriend, on his lunch break during work. He has forgotten his wallet and needs me to spot him. So I quickly get some money for him out from the ATM and shoo him away down Courtenay Place, feeling a little nervous. I find myself outside 49 Courtenay Place. "Margaret Hema is waiting, as promised, at the foot of a building I have barely noticed before, close to the Little Waffle Shop and Pharmacy." Margaret is waiting, as promised, at the foot of a building I have barely noticed before, close to the Little Waffle Shop and Pharmacy. Dressed in a yellow and lilac patterned dress with a gauzy texture she is shorter than I expected but easily recognisable by her flame Henna coloured hair. Margaret greets me warmly and we catch the elevator together up to her salon on the first floor. In a pink room of natural light it is dimmed by curtains, and Margaret begins the ritual of the Hema facial. Margaret first tells me I have beautiful skin – in her words “You have beautiful fabric”. Margaret Hema’s philosophy is based on the idea that skin is a beautiful fabric and it should be treated as such. “No foaming cleansers, toners and exfoliants” Margaret murmurs and she lifts and plays with my hair, relaxing my scalp. “I wouldn’t be in facials if I wasn’t using my products because I know it works”. Margaret began her life in Wellington, growing up in Lower Hutt in Taita. She is, like me, a first generation New Zealander born to an Irish mother and a Scottish father. She has kept some of the quirks one imagines of a genteel couple of that time, referring to her clients as “her ladies” as we talk. "Margaret’s life began in 1946 at a time where New Zealand was still waking up." Margaret’s life began in 1946 at a time where New Zealand was still waking up. Margaret liked the wee catholic primary school where she was educated by Irish nuns and left Sacred Heart College at 14. “By that time I had had enough of religion. I turned to my mother and said I wasn’t doing school anymore and that was that.” Margaret began working (“I always had a job”) and was also asked to do some modelling. She was a 60’s teen, dressed in 60’s fashion who devoured issues of Harpers and Queen and British Vogue. Margaret met Mr Hema at a dance down near the Wellington railways station. He was a musician in a band, and they were soon married at 18. After that at age 22 Margaret had the first of her three children, two girls and a son. Even then, it was as if it was her fate to do facials “I had always done facials, even before I knew how” she remarks, “with oil on peoples faces”. Margaret left Wellington with her children to move to Sydney. There she studied under experts, Aromatherapy and Beauty Therapy. Before long Margaret started experimenting with making her own oils, and then found the people she gave facials to asked for bottles of it to take away. From there, over the years she has massaged the faces of many Wellingtonion’s, ballet dancers, actors, cooks and everyone in between. But despite her success, Margaret doesn’t put it down to other people endorsing her product (although she acknowledges that that has helped). “Integrity” she says “is everything. I believe I have been successful because I have had integrity”. Margaret’s integrity means she only uses the finest oils in her products, rarely adds new products to the range, is opposed to micro dermabrasion and exfoliation and has a clean, minimalistic packaging which she has stuck to consistently over the years. “I ask my ladies whether you would put it on your hair” she says “You wouldn’t micro-dermabrase your hair!” Her own secret recipes of hand mixed oils have copyright and intellectual property status. “The secret” she says “to a healthy happy life is sleep and good food and lots of water”. All the while, Margaret massages my face and then my hands. She lets a blend of Manuka honey and oil into my face as she talks (this is the only product not for retail sale - but it still comes in its own beautiful box). Margaret Hema is thorough in her technique, and light of touch. She kneads my shoulders, taps my face, rubs my arms and wrists with her own, very soft hands. We finish our session and all at once she tells me to go and look at my face. My skin has been made seamless, bright and fleshy like a fresh rose. She has given it a peculiar luminosity that looks as though someone has put a bright filter on my face. Margaret then also gifts me three presents from her collection to use. I am truly stunned. Finally she shows me something no one else has seen yet - her next move. “I have decided to move from being just Hema, to labelling my bottles with Margaret Hema” she informs me, with pride. “I used to hide behind the label. If I was Hema, I was a bit removed. But now, I am ready to have my name.” It seems perfection can be always tweaked. "At 70 I feel so happy, alive with wonder" she types to me. "And today I visited the recycled shop and bought a jacket that is so so 60’s. I live in that era in my head and have never forgotten my beautiful friends of that time. I loved being a 60’s teen, we thought we could change the world." As I come down, back from the pink room, into Courtenay Place, I find myself blinking, like I have come back to the real world. I would like to have stayed there, to be honest, in the beautifully scented hands of the Godmother of Skincare, Margaret Hema. But life is not all oils and scents of magical ingredients. Indeed, no one else would know that more than Margaret. A few weeks later we are emailing to refine the content of the story. Margaret approves and tells me the day it will be published is her mothers birthday. "At 70 I feel so happy, alive with wonder" she types to me. "And today I visited the recycled shop and bought a jacket that is so so 60’s. I live in that era in my head and have never forgotten my beautiful friends of that time. I loved being a 60’s teen, we thought we could change the world." I hope that when I am Margaret's age, I too will be as positive and glowing with wonder still.